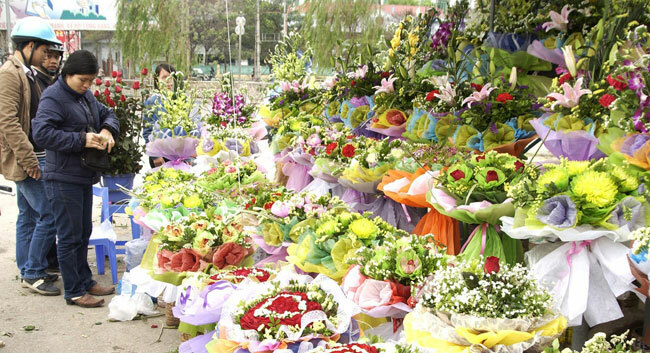 HCM CITY (VNS) — With International Women's Day fast approaching, people are flocking to supermarkets and shops to buy gifts for their loved ones. Stores are hoping to take advantage of the day and boost sales of cosmetics, clothes and gifts, through in-store promotions. Big C has launched a special programme dedicated to honouring Vietnamese beauty in its 26 supermarkets. They are offering discounts of up to 49 per cent on 2,000 products, including, cosmetics, fashion and fashion accessories, until March 31. Alongside this, female customers can enjoy free skincare consultations, as well as celebrity and expert in-store demonstrations. They are also slashing prices on more than 1,000 essential goods such as household items, food, and confectionery. The supermarket is hoping for a 15 per cent rise in sales thanks to the promotions. Similarity, Co-opmart supermarkets and Co-op Xtra Thu Duc are offering discounts of up to 50 per cent on more than 830 products such as garments, beauty care products, and household appliances until March 9. Other supermarkets like Citimart, Maximark, and Vinatexmart have also cut prices on hundreds of cosmetics and fashion products. Fashion and cosmetics shops along Nguyen Trai Street in District 5, and Nguyen Dinh Chieu and Le Van Sy streets in District 3 are decked out with promotion banners, hoping to benefit from the shopping frenzy. According to sellers, more and more customers now prefer to buy practical gifts, however cosmetics remain first choice. Flower prices have remained high since the Lunar New Year holiday due to cold weather, but they are still expected to be a popular gift.